It’s time for that monthly (weekly?) trip to Target to restock on items you’ve run out of…you know- toothpaste, face wash, seven new mugs, some fairy lights, room décor that doesn’t match anything else you have, and a pack of overpriced colored pens- only the essentials. Inevitably you’ll somehow end up shopping for lawnmowers when all you really needed was some shampoo. We all know how easy it is to divert from our original simple intentions in Target because actually choosing specific health and beauty products among the masses is completely overwhelming. Sometimes the easiest thing to do is bypass the fancier name brand product, grab the simple generic version, and call it a day- no fuss. But other times the generic versions are low quality, making them an even greater waste of money than the random (and oddly specialized) kitchen appliances that mysteriously end up in our carts. Target’s Up & Up skincare line is one private label that typically does a great job of producing quality products at reasonable prices. They offer dupes of name brand products that typically receive positive overall similarity reviews among our users. But, as with any rule, there are exceptions. These two products do not appear to be similar at all. The generic version has a stickier consistency, inferior packaging, and different ingredients. The Clean and Clear exfoliator is well worth the extra $2.50. This Up & Up version of the Banana Boat sunscreen had a much stronger scent and a watery texture. Reviewers preferred the thicker consistency of Banana Boat. Plus- there’s less than a dollar difference in price! This Up & Up dupe for the Dove moisturizing bar does not have nearly the same creamy texture. It is chalkier with a slight chemical odor to it- not quite as luxurious as a moisturizing bar should be. Treat yourself with the Dove bar! Tampons are a product you want to have 100% confidence in. Our reviewers did not feel confident in the Up & Up tampons primarily due to the lack of a braided leak guard, like the Tampax tampons have. 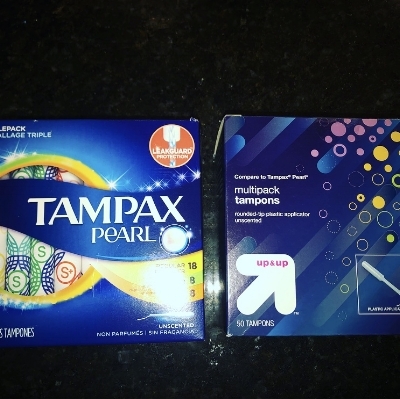 If shopping at Target, we recommend putting a couple of extra bucks toward the name brand tampons. Despite a decent similarity score, Dove’s version of this body wash gives an all-around more pleasurable experience. The smell is nicer, and to be honest the Up & Up version doesn’t even have much of a scent at all. When it comes to texture, Dove takes the cake with a creamier lather. This difference is obvious even looking at the two gels. While they do leave the skin with a similar feeling, the Dove wash is definitely more enjoyable.